Most days I feel like I’m walking in circles. Take a dish out, put it away. Send the kids outside, usher them back in. Wipe a nose, wipe another. Make a bed, tuck a kid in. Read a book, read it again. Take out a puzzle, put it away. Make a meal, beg the kids to eat it. Loose my temper, apologize. Put on shoes, pull them off. Sweep the floor. Sweep the floor. Sweep the floor. And despite this constant circular parade, despite the hours I spend standing over the sink, the bed, the toilets, the laundry…the house never really feels clean. And if it does, it is only momentarily. A couple of days ago I busied myself cleaning the kitchen of our new house. It’s new, after all, let’s try and keep it clean. 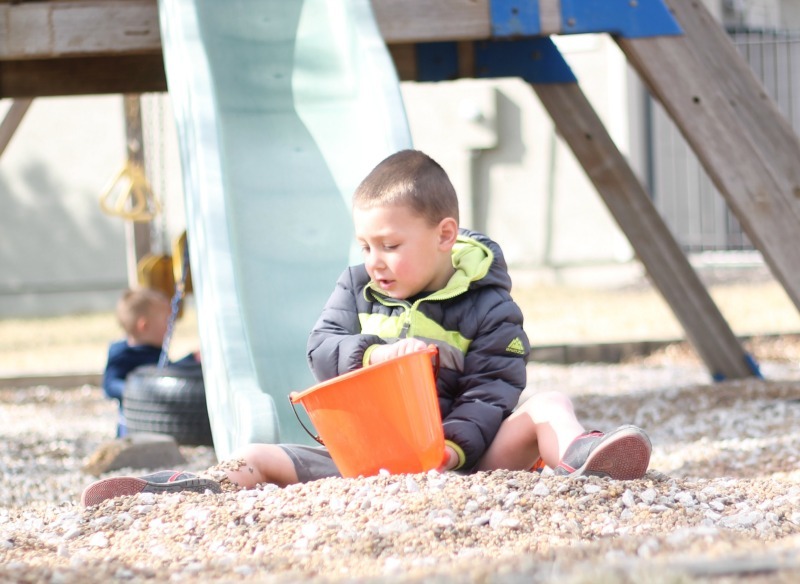 After lunch I had sent the kids outside to enjoy the 70 degree weather (Kansas, we love you) and, wonder of wonders, they stayed out there and laughed and played and gave me time to scrub the dishes, wipe the counters, sweep the floor, fold the laundry and put it away. It was a Kansas City mid-February Miracle. When the screaming started minutes after I returned to the kitchen with an empty laundry basket I felt good, accomplished and like the mom and wife I had always wanted to be–like all I needed now was a cute little apron and a size 2 waist. I opened to the door to two screaming children, and one looking sheepishly guilty. I sweetly welcomed them inside. Only once they were out of the bright sun and standing in the middle of my kitchen did I see how dirty they were. Red sidewalk chalk was smired all over their arms and faces and hands. Their shoes were full of mulch and dirt, which they flung to all corners of my house as they kicked off their shoes emotionally. The baby’s nose as dripping and the snot had mingled with dirt to create a sort of sick-baby beard. And in the blink of an eye the floors were dirty, my windows were smudged with crud and the snack they demanded was sprinkled and spread throughout the kitchen. 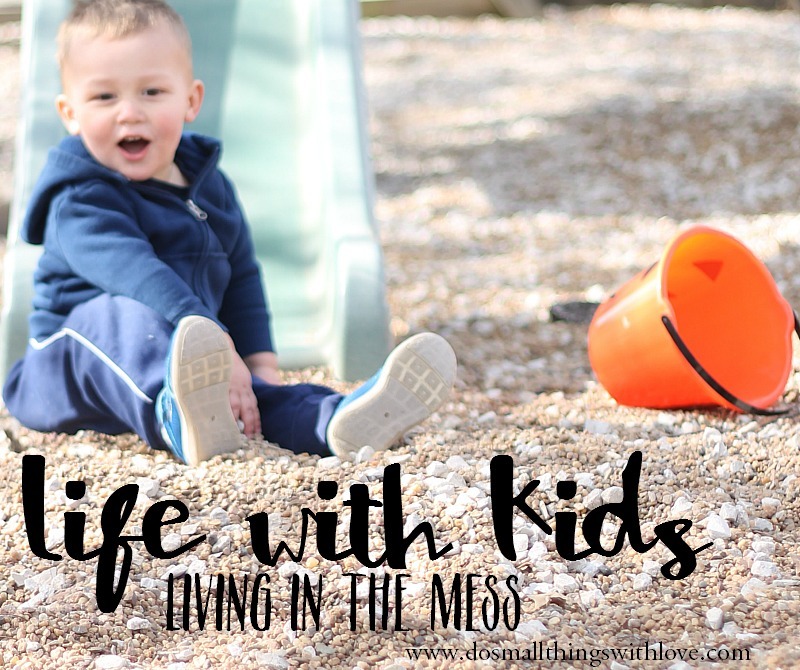 This messy life with kids is frustrating, even disheartening. It’s hard at the end of the day when I come downstairs to face the disaster of the kitchen. Wasn’t I cleaning this kitchen all day? How does it look like this? But each and every night I do clean and scrub and get everything put away and orderly for the morning, when the chaos and the mess will descend once more. So here I sit, at the kitchen table I just scrubbed, the kids peacefully sleeping upstairs and, for now, all is clean and orderly. But even still, the kids have left their mark. The table I sit at is full of scratches and dents made by forks and spoons as they pound along with a song they are singing at the top of their longs or protest the meal I have put in front of them. The booster seats I quickly wiped and slid under the table still contain bits of carrot or cheese. The corner of the table has bite marks from my Bernadette. Yes, this is a table where kids eat, and this is a house where kids live. There are a handful of beads scattered on my steps that I will likely pick up as I head to bed. A pile of picture books are stacked haphazardly by the front door. Two gallons of peeler beads are perched on the kitchen island. There is no mistaking the presence of children here. Because that’s what kids do to us–they leave a mark. They mark our houses, our yards, our possessions, our bodies, and our very souls. Each of my babies have added another stretch mark to my body–and once out of the womb each of them have broke, wrote, engraved or destroyed something in my home. They leave their mark, each day. There is no doubt that motherhood and being around these children has changed me, body and soul. My fears and dreams and hopes have all changed, mostly in ways I never would have expected. With each new child our family is changed as well. Each new personality wedges it’s way in among us, pulls more love out of us than we thought possible and squirms their way into the deepest corner of our hearts. Because that’s what kids do. They make life messy and loud and frustrating and exhausting and terribly wonderful. They get their grubby little hands all over our heart, and thank goodness they do. Blessings, sweet mothers out there. I am going to try to live a little more peacefully in the mess tomorrow. I hope you can too. I love this so much Nancy and it speaks to my heart and where I am in life as well, for right now. In two weeks Dale and Sarah close on their new home (they’ve lived with us for for well over a year and I have loved every minute of them living with us, even with all the things you outlined in your blog). 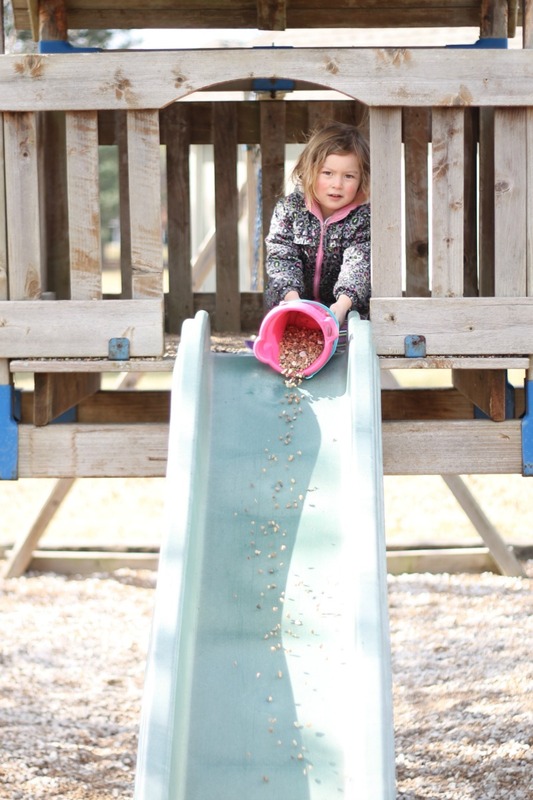 There are so many more things about having little kids in my house that I will miss, than those that I don’t (I’m getting tears as I write this). Enjoy this time, even though moments are hard, they won’t last forever and the excitement when you walk through the door (Nana!!!!) the hard part (but also the un-contained excitement) won’t be there forever. When the biggest excitement of the day is a little one deciding that today is the day they are going to start going potty on the potty chair every time, fades, and it replaced by and equally wonderful next phase. Love it all for those of us who miss it. Life is wonderful and God is so good to us, even though we don’t deserve it. I have been truly blessed by this experience and will deeply miss it. Oh Cheryl, how beautiful that you had this time with your grandbabies! It is something to actually live in the same house as kids, isn’t it, not just near them? It’s all the small moments, I think, that make live so beautiful. Prayers for Dale and Sarah during this transition. Moving is exciting, but when doing it with kids it can be intense!